Christine Marie “Chris” Evert (born December 21, 1954 in Ft. Lauderdale, FL) is a former world No. 1 professional tennis player. Evert graduated from St. Thomas Aquinas High School in Ft. Lauderdale in 1973. She went on to win 18 Grand Slam singles championships, including a record seven championships at the French Open and a record six championships at the U.S. Open. According to the Women’s Tennis Association, she was the year-ending World No. 1 singles player in 1975, 1976, 1977, 1980, and 1981 and, according to many sources, in 1974 and 1978, also. Evert’s career win–loss record in singles matches of 1,309–146 (.900) is the best of any professional player in tennis history. In tennis writer Steve Flink’s book The Greatest Tennis Matches of the Twentieth Century, he named Evert as the third best female player of the 20th century, after Steffi Graff and Martina Navratilova. Evert never lost in the first or second rounds of a Grand Slam singles tournament. She won 157 singles championships. 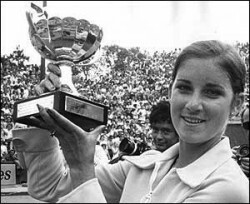 In women’s doubles, Evert won three Grand Slam titles and 29 regular tour championships.